Habitat: A mixture of mature hardwood forests and open fields. Weight: Adult male: 15 to 25 pounds; adult female: 8 to 12 pounds. Length: Adult male: 48 inches; adult female: 36 inches. 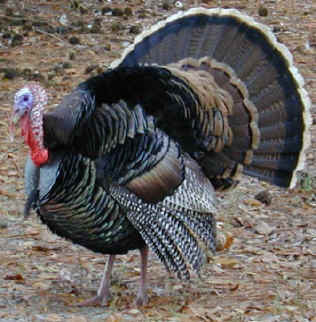 The wild turkey is the largest of <?xml:namespace prefix = st1 ns = "urn:schemas-microsoft-com:office:smarttags" />North America's game birds. 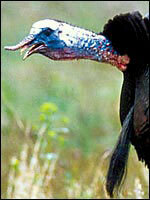 Adult males, known as toms, or gobblers, normally weigh between 16 and 24 pounds. Females, known as hens, are smaller than males and usually weigh between 8 and ten pounds. (particularly) feed heavily on insects. Males: Iridescent red, green, copper, bronze and gold feathers. Toms use these bright colors to great advantage when attracting females during breeding season! Females: Drab, usually brown or gray feathers. They make great camouflage and hide hens when they sit on their nests. ild turkey tails are usually 12 to 15 inches long and are banded at their tips. The color of the bands in the tail varies by subspecies. 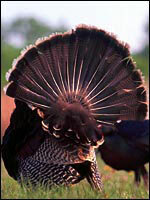 Male wild turkeys fan their tails when displaying to attract a mate. Males: Males have brightly colored, nearly featherless heads. During breeding season the color of their heads alternates between red, white and blue, often changing in a few seconds. Hens: A hen's head is gray-blue and has some small feathers for camouflage.